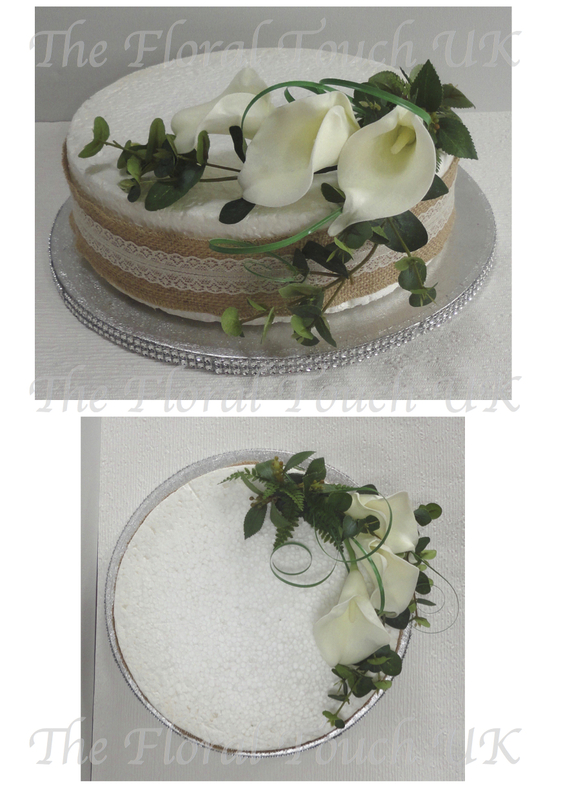 Real Touch Calla Lily Cake Topper - Lovely contemporary spray of real touch calla lilies with eucalyptus, beargrass and various foliage. 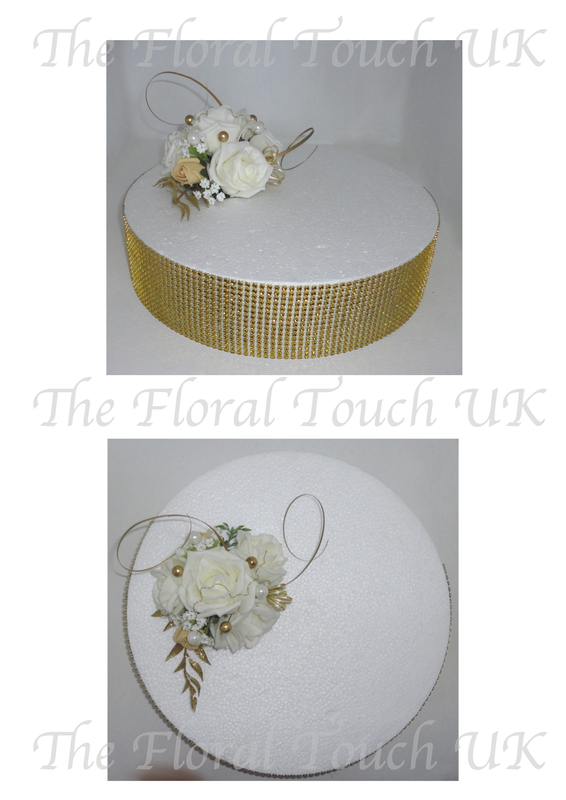 Golden Wedding Anniversary Cake Topper - Beautiful Ivory roses with gold buds, gold & ivory pearls, gypsophila and gold beargrass and gold sparkle leaf spray with gold & ivory ribbon. 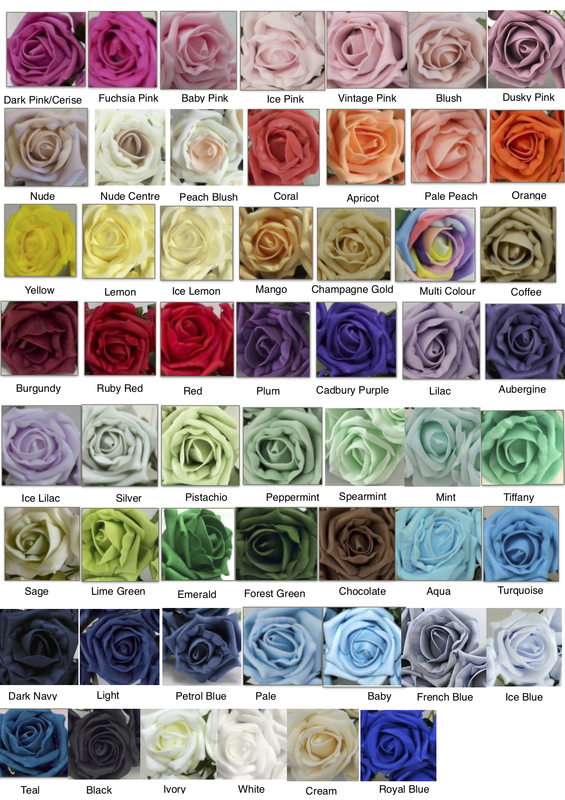 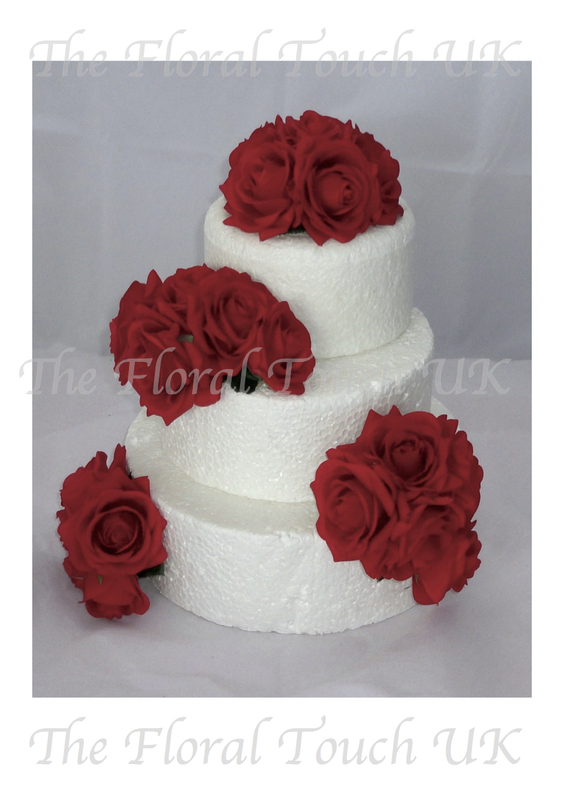 Fresh Touch Red Rose Cake Flowers - Stunning fresh touch roses so lifelike you wont believe they are artificial - they look real, feel real and smell real. 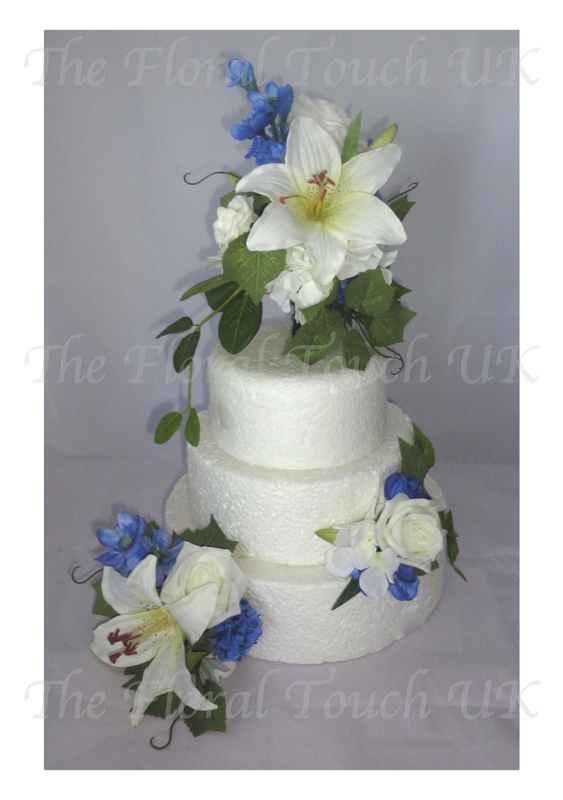 Blue & Ivory Raised Cake Topper - Stunning cake topper and side sprays - The cake topper stands upright on a bamboo pick that is inserted into the cake, created using ivory tiger lilies, roses and hydrangea with blue cornflowers and blue delphinium and vine leaf foliage with a leaf spray cascade. 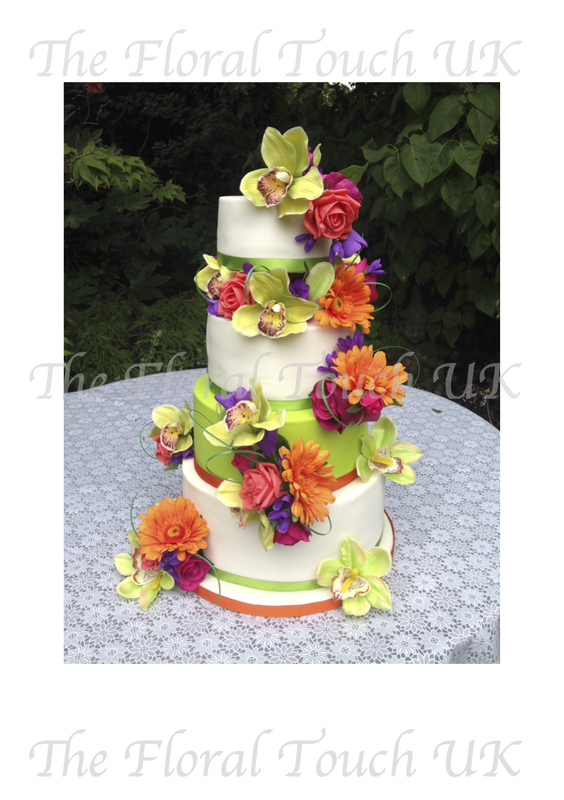 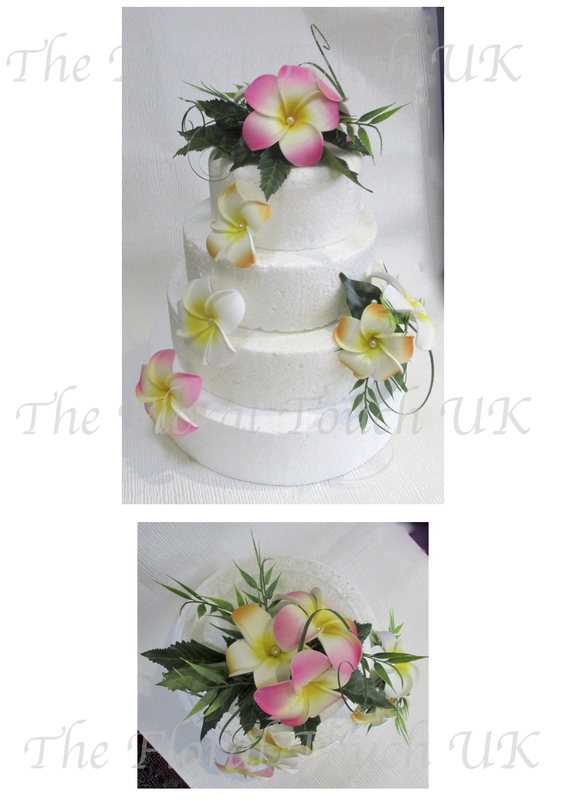 Tropical Cake Flowers - Tropical theme cake flowers a beautiful array of tropical colours and flowers including orchids, gerberas, roses, freesia with beargrass loops. 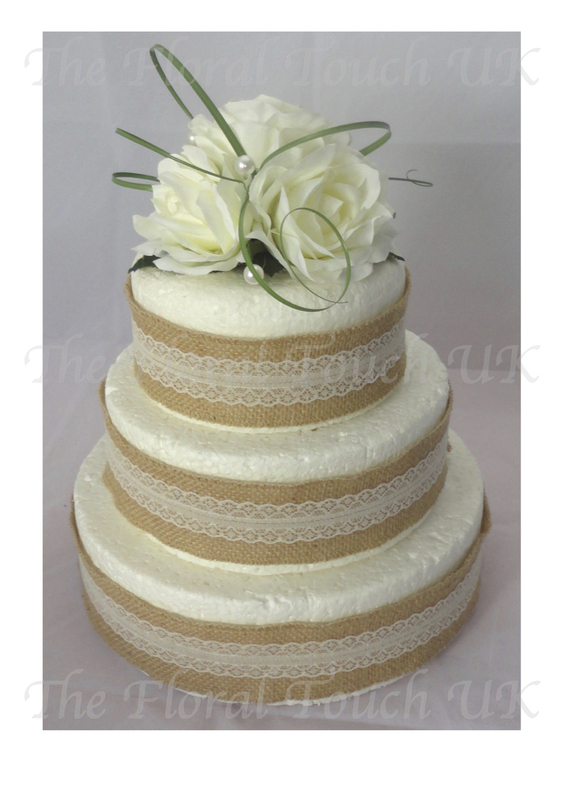 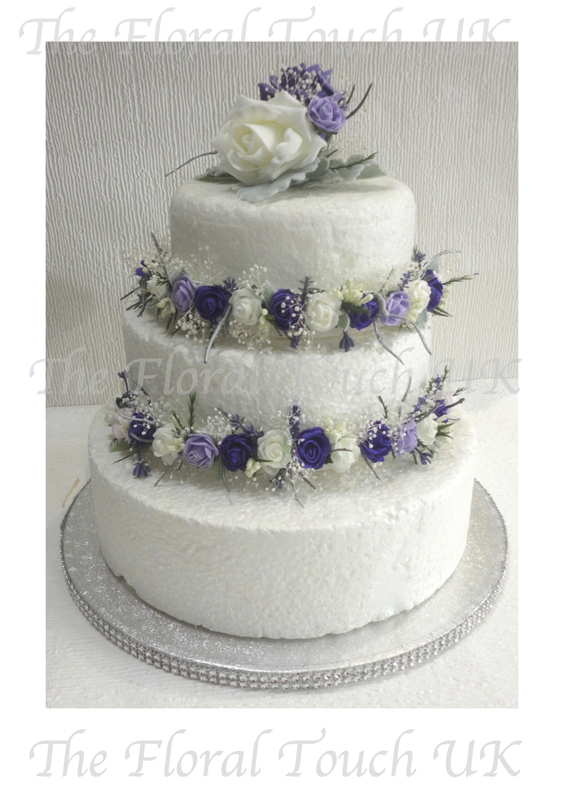 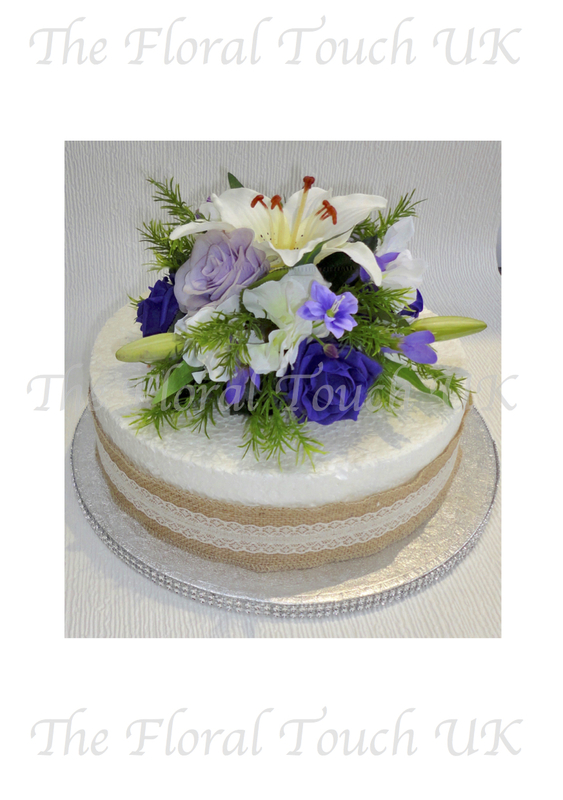 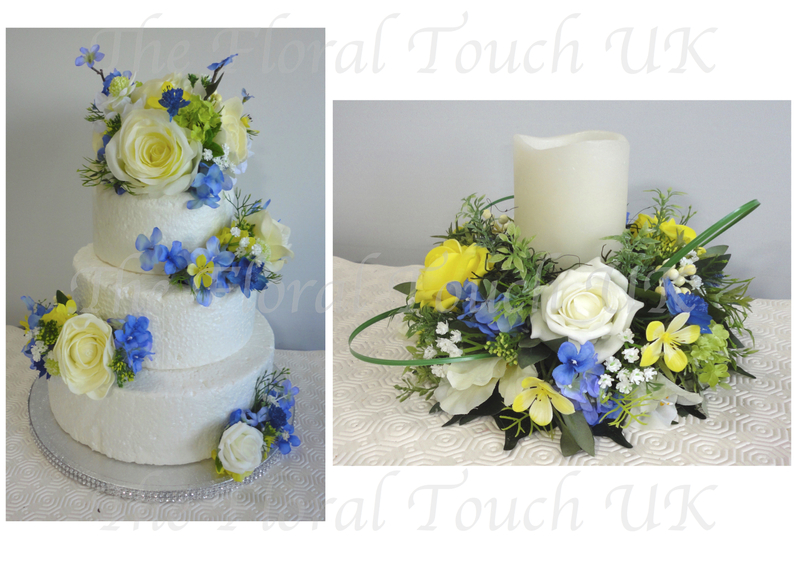 The topper having a small cascade that falls down the side of the cake and the centre part being a floral wreath. 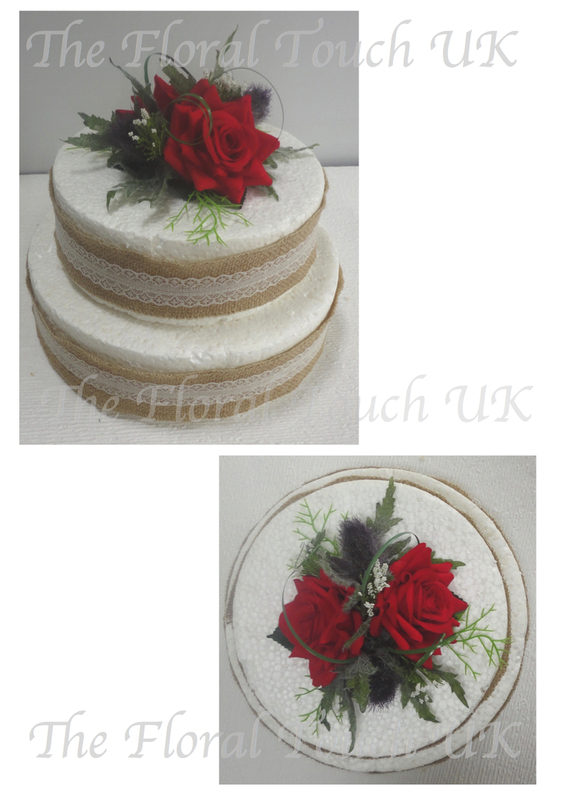 Red Rose & Thistle Cake Topper - A lovely cake topper of red silk prize roses and thistles with trachelium, beargrass and lovely realistic flocked foliage. 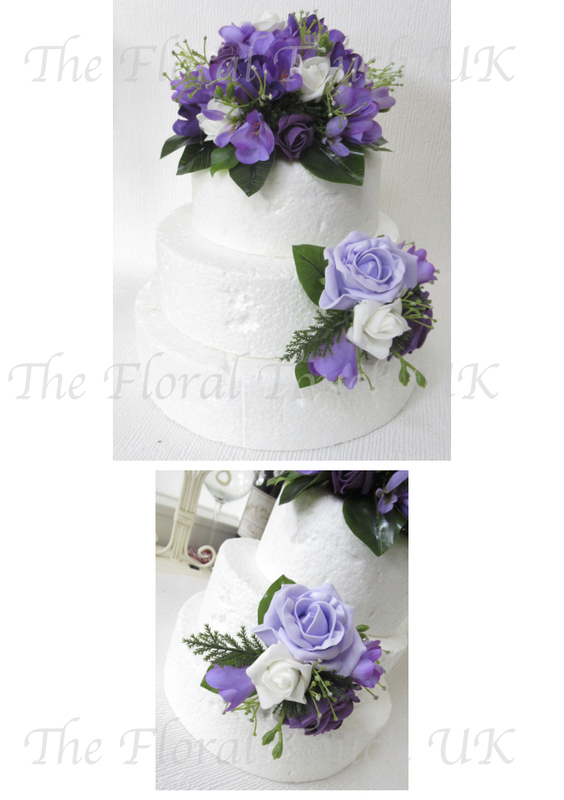 Country Woodland Cake Topper and Cake Wreaths - Cake topper and floral wreaths of Ivory, purple and lilac mini roses with silver twigs and foliage sprays, pale silvery sage green flocked foliage and freeze dried gypsophila. 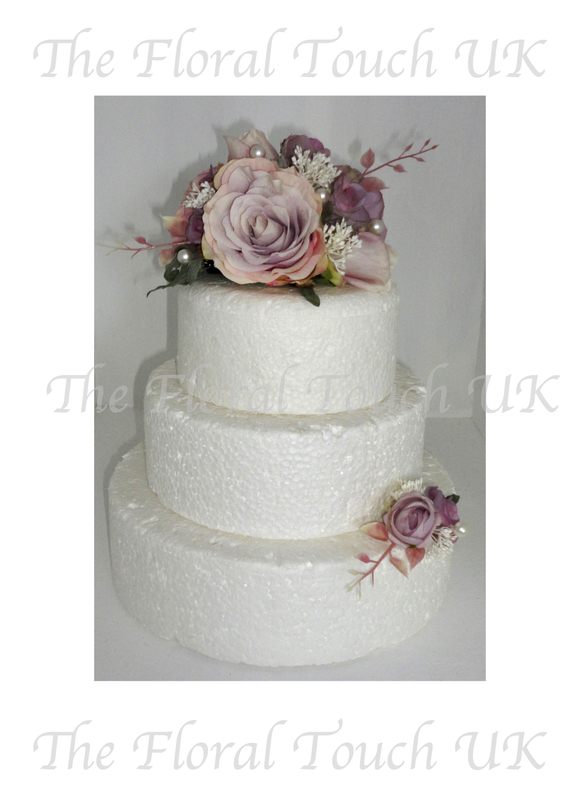 Vintage Rose Cake Topper & Small Tier Spray - Dusky mauve & dusky pink cake topper with large roses, rose buds and wild rose sprays, trachelium and leaf sprays with pearl detail.